continuing to push the limits of hybrid performance, far beyond expectations. Now, you can experience a revolutionary new system from Lexus: Multi Stage Hybrid, for the LC 500h and LS 500h. A 4-speed automatic transmission is added alongside the existing CVT (continuous variable transmission). 10 gears are simulated, evoking the 10 gears of the LC 500 petrol engine. The driver can change through these dynamic speeds, without delay, using paddle-shifts on the wheel. The result? An enhanced, sportier feeling. Dynamic, fast, and connected, this is the most responsive and performance-ready hybrid system ever. You’ll enjoy fierce power when you hit the accelerator, and smart efficiency when you’re at a more relaxed pace. Multi Stage Hybrid sets the tone for what’s to come. It will influence the wider Lexus range, as we continue to lead the way in hybrid technology. Lexus Hybrid monitors your driving conditions and seamlessly controls the combination of power, making the optimum choice for you. But if you wish, you can control how you drive: electric, combined, or petrol. From start up, to acceleration, mid-journey, and deceleration, you can be the decision maker. For your whole journey, or just a part of it. Together, you and your vehicle consult to lower emissions and boost performance. Normal mode ensures the optimal balance of fuel efficiency and engine performance. Sport mode brings you faster and more dynamic throttle response, for increased steering feel. 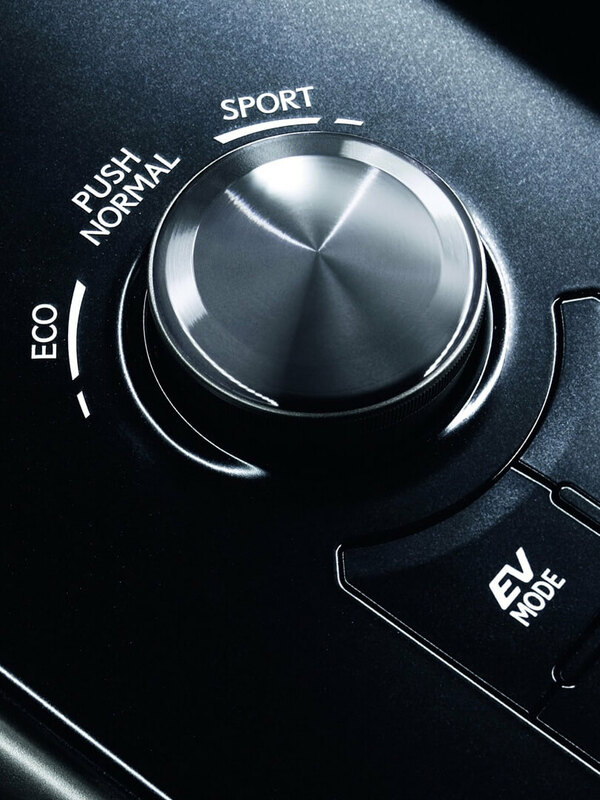 And ECO mode moderates the throttle, engine power and climate settings for greater fuel efficiency.